I have a love/hate relationship with fall. 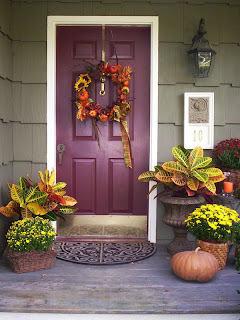 Now don't get me wrong, I think fall is wonderful with all the beautiful colors, fall crafts and great treats. I also love picking apples, trick or treating, hayrides, football games and all the fun activities of fall. What I don't like is the fact that fall means we have put an end to sleeping in and go back to crazy busy schedules. (I have 3 kid in 3 different schools, all of which will have lots of homework, enough said!) I also dont like that fall means that winter is once again going to arrive in a few short months. I am not a fan of snow, cold and ice and where I live, we seem to have a lot of it. Michigan winters seem to start in November, and don't end until April. I dont like to think of Halloween in Aug, and Christmas in Oct. With that being said, I was thinking that maybe looking at all the great fall ideas on Pinterest, and the blogs might help me be a little more excited about the end of summer. 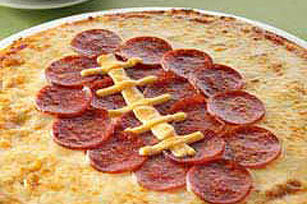 I do like watching football and love to eat pizza. I like how Kraftrecipes.com mixes the two. 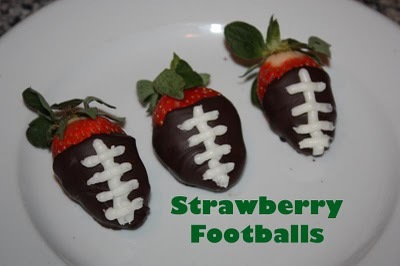 I also love chocolate and strawberries together. How cute are these strawberry footballs from From Glitter to Gumdrops. 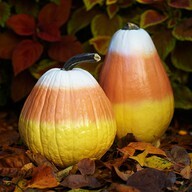 I never would have thought to paint pumpkins to look like candy corn. There are from bhg.com. 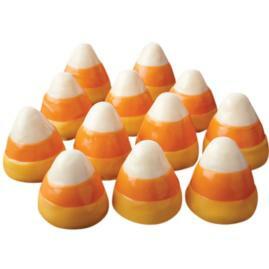 Wilton.com has directions on how to make candy corn brownie pops. I do admit I really like the look of a pretty decorated porch ready for fall. I found this picture on the HGTV.com website. Still not sure I am ready to give up my summer yet. These are all great ideas! Living in Florida, our thoughts are always when it is going to get cooler and the humidity will drop!! It during the months of Nov and April, I wish I lived in Florida.. LOL! Hi, I featured your painted garden pavers project at my blog hop. You are welcome to take my featured button on the side bar, too!